Leinster and Ireland open-side Shane Jennings has scrapped and fought with the best in Europe since breaking on to the Irish provincial scene with Leinster in 2004. 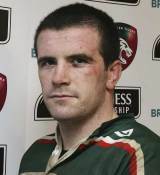 While standing in for Keith Gleeson during the 2004-05 Heineken Cup, Jennings did enough to secure a contract with English Premiership side Leicester Tigers. At the Tigers Jennings won the Premiership and Anglo-Welsh Cup before coming second in the rankings for Premiership Player of the Year in 2007. Jennings won his first Ireland cap on the 2007 tour of Argentina, before injury ruled him out of contention for Ireland's 2007 Rugby World Cup squad. Jennings had previously skippered Ireland A to victory in the Churchill Cup plate final. Prior to the 2007-08 season, Jennings re-signed with Leinster, entering into a rich vein of form alongside No.8 Jamie Heaslip. Jennings won two caps during Ireland's 2008 autumn series, starting against Canada and coming on as a replacement against New Zealand. Later the same season he shared in Leinster's historic Heineken Cup success - starting the memorable semi-final victory over Irish rivals Munster and their victory over Leicester Tigers in the Murrayfield finale. At the start of the 2009-10 season he received a blow to his international ambitions when he was banned for 12 weeks after being found guilty of gouging London Irish lock Nick Kennedy during their Heineken Cup clash at the RDS. Neverthless he returned on Ireland's summer tour, winning a start against Australia in Brisbane following a number of injuries. And Jennings was a late call-up to the Ireland 30-man squad for the World Cup as a replacement for the injured David Wallace. His call-up followed a successful season with Leinster where he was part of the side which took the 2011 Heineken Cup.